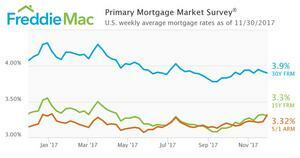 MCLEAN, VA--(Marketwired - Nov 30, 2017) - Freddie Mac (OTCQB: FMCC) today released the results of its Primary Mortgage Market Survey® (PMMS®), showing the average 30-year fixed mortgage rate inching lower. "The 30-year fixed mortgage rate fell two basis points to 3.9 percent in this week's survey, but we closed our survey prior to a surge in long-term interest rates following an upward revision to third quarter U.S. Real GDP growth and comments by Federal Reserve Chair Yellen touting a broad-based economic expansion. "The market implied probability of a Fed rate hike in December neared 100 percent, helping to drive short term interest rates higher. The 5/1 Hybrid ARM, which is more sensitive to short-term rates than the 30-year fixed mortgage, increased 10 basis points to 3.32 percent in this week's survey. The spread between the 30-year fixed mortgage and 5/1 Hybrid ARM is just 58 basis points this week, the lowest spread since November of 2012."